You want to become an owner operator , eh? Well, there's some very good info in this article so I recommend you read it through and leave me a comment in our forum - I want to know what you think. First things first. Have you lost your mind? Well, maybe not. Maybe you're just pondering the idea because you don't understand the trucking industry, or you're looking for a new challenge. Maybe owning your own business sounds perfect to you? Maybe the romantic idea of cruisin' the American highways in your own big, beautiful, shiny rig just sounds so damn cool you can't take it anymore! But wait...wait...wait.....come back here a second. Get out your wallet. Now give me all your money. No I'm not robbing you! You're a giver! You've decided that having money isn't important to you anymore, so you're going to buy a truck so that you can throw it all away! Well, I need it! So if you're gonna lose it all anyhow you oughta just give it to someone who needs it - like me! You say you don't understand what on Earth I'm talking about? Well then you better keep reading. There must be a lot you don't understand. I get questions quite often from people about becoming owner operators, especially (ironically enough) since the economy has slowed and fuel prices have dropped. I figured since this guy sounds rather intelligent, opportunistic, and ambitious, I thought I'd share this one with you guys. Brett, after reading through your website I see that your primary focus is on new drivers. However, due to your experience and exposure and your obvious communication skills, I'm betting you can give me some insight - and perhaps some contacts - that will allow me to take "the next step" into the owner/operator world. I've been trucking over-the-road (this time) since 1998, have nearly 2 million miles behind me as a company driver (3 companies), and I want to get into my own truck. As you rightfully point out on your website, most of a trucker's world is an isolated one, and that includes being isolated from other drivers. 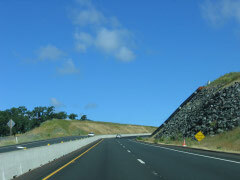 I got real tired of the filth on the CB very early-on and I spend maximum time in my truck taking college classes, reading and blogging politics. Thus, I actually know little about the entirety of the trucking industry. Right now the loads are far and few between, but I'm figuring that with the low fuel prices, as well as the relatively low truck prices, this might be a good time to buy a truck. What do you think? 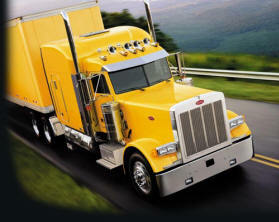 Trucking is a commodity business - the only thing that matters to anyone is price. So the trucking company that can offer the lowest price gets the load. Everyone else loses. Correct? "If you're going to go into a commodity-type business, remember that there is only one winner - the one who offers the lowest price. Even that person barely wins because their profit margins are always razor-thin and on the edge of breaking even or losing money. So if you're going to do it, you'd better be the low-cost provider, because the second lowest cost provider and everyone else behind him goes out of business." Listen, Bruce - you're taking college courses and reading all the time. You sound like me - I taught myself computer programming during my years on the road. Besides truck driving school, I have also graduated from Motorcycle Mechanics Institute as a Harley mechanic, I'm a certified welder, and I've owned a tree service ( I was the crazy climber!). I love to learn and challenge myself. That's why I've had so many careers! It sounds to me like you want to push forward in life - challenge yourself, make your life better. There are very, very few people out there like that anymore. Life has been too easy for an entire generation of us now. I'm 37 years old - and the only suffering I have done is self-inflicted. Sports, physical training, bad decisions, and working injuries. There have been no World Wars in my lifetime. There have been no economic depressions. I've never gone hungry. And believe me, I was not raised by rich parents. A bookkeeper and a factory worker. Blue-collar all the way. Just your ordinary, perfectly wonderful small town upbringing. A dream life for sure. So for my generation and those that have followed, toughness, ambition, and hard work is something we were either born with or taught by our parents. It wasn't burned into us by the hardships of world wars, economic depressions, and moral dilemmas - like the way Vietnam divided the country and spawned the hippie generation who tired of constant war and pain and suffering. For people like us, hardships that test and forge our character and push us to our limits must be self-generated. Rock climbing, scuba diving, skydiving, running, and weightlifting in the physical realm. Spiritual reading, starting a business, or going to college in the cerebral realm. There are many ways to generate hardship for those of us who are so inclined. You want hardship? Become an owner operator. Obligate yours for years in the trucking business and lose all of your flexibility in life when you buy that truck. Struggle and suffer through the anxiety of making a huge investment in something that will likely never make you any money over time. Try to be a one-man band offering the lowest price by beating out the competition from the large companies who are getting volume discounts on fuel, tires, parts, and mechanical work. Large companies who have services to provide that you can't - like dropped trailers, flexible scheduling when loads suddenly increase or decrease from a shipper , and team runs coast to coast in 48 hours. Large companies who have gigantic pools of financing behind them from bond issuance, private equity, public equity (stock offerings), and collateral-based financing from the equipment and real estate they own which allows them to operate at a loss for years if need be. And maybe down the line if trucking doesn't work for you anymore then you could open up your own little department store right between a Wal-Mart and a Dollar Store. Everybody has skills and abilities that make them unique. Traits that set them apart. Strong points that help them overcome their weak points. Find your strong points and carve out a niche in life that gives you an advantage over most of the competition. Do something that you'll love to do, but make sure that not many people will be willing to work as hard at it or become as good at it as you will. Then attack! As one website I frequent states (www.compete.com) - "Track Your Rivals. Then Eat Their Lunch." I love that. I love to compete. I love to push myself to my limits. I love to learn. I love to run my own business. I'm just that type. And from what I know of the trucking industry, becoming an owner operator is a game that most people lose in a big, big way. Sure, some win. But what is winning? Breaking even? Making a few grand a year after expenses? I don't know - I never tried it. I never will. 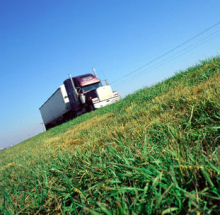 There are lot of "next steps" you can take in the trucking industry. You can become a trainer. You can work your way up in the offices of a larger company. You can become a freight broker. You can become an advisor. You can learn computer programming and write software for the industry. But becoming an owner operator has been a mission of financial suicide for the vast majority that have gone that route. Look at it from the shipper's standpoint - what advantages will you offer that says they should use you instead of the companies they've been using for years? "What about these companies like Landstar that are only owner-operators? Will leasing on to them give me an advantage?" you ask. Well, it will surely be better than staying independent and trying to find your own freight and discounts on products and services. But if owning a truck is so profitable, then why do so many companies allow owner-operators in their fleets? Anytime someone offers me an opportunity to get into business with them doing what they are doing - like becoming an owner operator and leasing on with them, or raising alpacas, or starting my own home-based business - I always ask myself the same question - if being in that business is so profitable, then why don't you just scale it larger yourself? Why do you want me to do what you're already making so much money doing? It doesn't make any sense! I'll give you an example. Krispy Kreme used to be a bigshot. Their donuts are delicious for sure. I mean, my God! Amazing! Krispy Kreme was a company that offered franchise opportunities - anyone could start one. But you had to use the company's recipes and buy your equipment from them also. Well, Krispy Kreme has since collapsed. Why? Because it turns out that owning a donut shop is not really very profitable. What was profitable was selling the licensing rights, food, and equipment to the franchisees! The vast majority of the money that the company itself made was not from selling donuts, it was from selling franchises. Well, owning a franchise became more and more expensive because the company had to continue to grow their profits to satisfy Wall Street. On top of that, the market became saturated once a huge number of franchises were opened and they began selling donuts to every gas station, convenience store, grocery store, and restaurant that wanted them. Eventually, the business model collapsed. If owning a truck was so profitable, companies wouldn't want other people owning their own trucks. If raising alpacas was so profitable, people raising them wouldn't want other people raising them. They would just raise more themselves! There are a million business opportunities out there, and all of them offer fierce competition and endless challenges. But owning a truck is nearly a financial suicide mission. 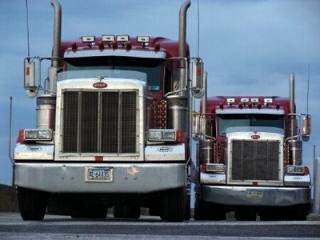 If you love trucking, then keep on letting those companies pay you $55k/year to drive their big, beautiful, shiny trucks - and let them suffer through all the headaches of running a commodity business. Licensing, fuel, permits, breakdowns, insurance - blah!!!! You just kick back, enjoy the ride, and make a killer living viewing the beautiful scenery across North America in your company's dream machine. And if you get tired of trucking - quit. A company driver can always just quit and return later at any time. Drive for six months, quit that job, party for two months, run out of money, go back to truckin'. Do whatever you like. But if you buy a truck, man are you in it up to your eyebrows then! But if I can't change your mind, then my best guess would be to talk to one of the larger owner operator companies like Landstar. Actually, first talk to their drivers. Get the real scoop on life as an owner-operator. And don't be shy about telling these guys to be straight up with you. You're not there to hear any fairytales, you're there to get the truth about owning a rig. Talk to a bunch of drivers, not just one or two. See what they say. Then, when you've heard a million opinions on becoming an owner operator, you've discussed all the strategies, and you're certain you've gathered all the information that is most critical to becoming an owner-operator, don't just walk away from the whole thing - RUN! Run for your financial life! For the love of God, man, get outta there while you can!